I spent many happy years on the beaches of Southern California - Santa Monica (Muscle Beach), Venice, Huntington Beach (now officially called Surf City), and Manhattan Beach - so I know something about the sun and how it can damage the skin. There is no doubt that the sun feels good, and it's fun to cavort around in a bathing suit absorbing all its "friendly" ultraviolet radiation. In reality, though, the sun is not skin-friendly. The damage the sun produces in the skin and eyes is cumulative. It builds up over the years making our skin less clear and resilient, and our vision less sharp. The light we get from the sun is organized by the different wavelengths. UVA has a wavelength that is longer than UVB. Neither one of these wavelengths is visible to the human eye. UVA is responsible for about 20 percent of a sunburn; UVB is responsible for about 80 percent of a sunburn. Both of these wavelengths in the spectrum will give you a tan that will minimally protect against UVB induced sunburn. All this sounds harmless enough. After all, everyone gets a little sunburn once in a while. And some people actually get a good tan. So what's to be done if we want to keep our skin looking young and healthy? The answer is simple in theory but not in practice. Stay out of the sun between 10 a.m. and 4 p.m. - when damage from the sun is at it peak. And if you do go out in the sun in these hours use some broad spectrum sunscreen properly applied, and wear some protective (not a wet T-shirt) clothing. Don't do this! 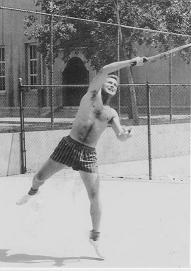 I played tennis almost every day for hours in the California sun - and without any kind of protection. My skin didn't get too messed up, but it would have been healthier without all that UVA and UVB radiation. Paula Begoun, where were you when I needed you? Please read her chapter 5, called Sun Sense in the Beauty Bible. This is the best, most comprehensive essay on the dangers of sun exposure that I've seen. The 36 pages in this chapter should be read every time you start contemplating getting a good tan. Paula does not think there is such a thing as a "good" tan. A few months ago I went ballroom dancing where the lights were dimmed low. Two women who I never saw before were sitting together. They both had deep tans - perhaps they were on a cruise together. Under the dim lights when I danced with them, they looked beautiful. When the lights became brighter, however, I could see the signs of sun-damaged skin especially in the older woman - small wrinkles, dryness, and lack of elasticity. The younger woman's skin had only minor damage. Of course I did not go into my lecture on sun damage. I stayed with the subject of how good the music was. Please don't look at this case of - Unilateral Sun Damage - and my comments. It's almost too much of a downer. My opinion is that there is only one thing worse for the skin than prolonged unprotected sun exposure. That one thing is sun-tanning machines. Don't believe the advertising that tells you how "safe" these machines are. Most of the sunscreens you'll find in the drugstores these days are broad spectrum - that is, they claim to protect you from both UVA and UVB. They give you UVA protection because the makers of these sunscreens add a chemical (an active ingredient) that absorbs UVA light. But here's the problem - They don't absorb all the UVA light. So just because you are slathered down with a broad spectrum sunscreen doesn't mean you can spend all day in the sun with impunity. Sunscreens with an adequate SPF (sun protection factor) number do give good protection against UVB light though. The SPF number tells you how long you can stay in the sun without getting burned. For example, if you are using Neutrogena Sensitive Skin with a SPF number of 30, you can stay in the sun 30 times longer without getting burned than you could if you were unprotected by a sunscreen. But this is under optimal conditions where you have applied the product correctly and perhaps reapplied it several times after going in the water. I've read articles stating that sunscreen might be an "enabler" giving people a false sense of security while spending hours in the sun. The SPF 30 (or 15 or whatever) is no guarantee that you will not suffer some skin damage if you stay long hours on the beach or on the tennis court. Here's a depressing bit of news: getting a lot of sun and a good tan when we are young has implications years down the road. The sun we get as teenagers causes cumulative damage in the deeper layers of the skin. This damage does not show up for many years, perhaps until we are 50 or 60 years of age. Then the brown spots or worse begin to show up. In general, women's skin might be more sensitive to the sun than men's. Because women often have lighter skin than men of the same race, they are more susceptible to sunburn. By the way, a woman's skin gets lighter at puberty when melanin production goes down as her estrogen level goes up. This lighter skin tone might be an indicator of fertility - a turn-on for men. A pregnant woman's skin gets darker.